When you no longer have any teeth left in the jawbone, the body senses that the bone is no longer needed. The bone is slowly resorbed so the body can use these minerals elsewhere in the body. This condition is called facial collapse. Many people have never heard of it. That is probably due to the fact that it takes place very slowly, over the course of 10 to 20 years. But the truth is that facial collapse is inevitable if you have complete dentures. The denture will become very uncomfortable to wear and the patient won’t be able to eat or talk normally. As the condition worsens, the patient may become a dental cripple which means it will eventually become impossible to wear a denture. The individual will appear much older than they are and their face will appear sunken in. 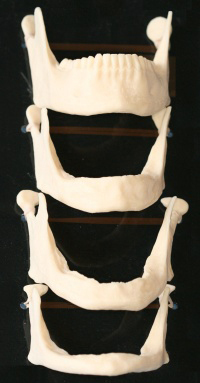 The image shown on the right is a series of jawbone models that demonstrate the varying stages of facial collapse. All of the teeth are present in the top image. The next one down shows the teeth having been removed. Once this occurs, you can see in the third model that significant bone loss occurs. This bone loss is rapid at first over the first several weeks of missing teeth, then it slows down dramatically. It may take up to 20 years before a patient becomes a complete dental cripple. This diagram is courtesy of Dr. Carl E. Misch’s textbook, Dental Implant Prosthetics. The good news is that facial collapse can be prevented. Dental implants prevent the bone resportion process in the area surrounding each dental implant. They will also stabilize your denture and keep it from coming out at embarrassing times. For those that think they can’t afford dental implants, even just the placement of a couple implants helps significantly. Snap-on dentures are a more affordable option that can be used to prevent this serious condition. The more dental implants that are placed, the more likely that facial collapse will be prevented. If your budget will allow it, we recommend up to six or eight implants per arch. If you have any questions, we are happy to help. Schedule a complimentary consultation today at 225-292-4321. You can meet the dentist and we can help you determine what the costs may be for the various treatment options available.